Knowing that several of the shortlisted entries for this year’s RIBA Stirling Prize for architecture were from practices which have also produced several transport buildings, I thought I would be terribly clever and use the award as a way into this week’s blog entry. Unfortunately, when the winner was announced last Thursday, the award went to the Everyman Theatre in Liverpool, by Haworth Tompkins. It’s not a building that’s really my cup of tea, but most pertinently, Haworth Tompkins hasn’t delivered any transport buildings (you can see its complete works here). On the other hand, Zaha Hadid Architects was shortlisted for its London Aquatics Centre (my personal favourite on the shortlist) so I’m going to use that as an excuse to have a look at a Zaha Hadid Architects transport building. It’s on a light rail system, all too often the parts of public transport that aesthetics almost forgot. The surprising thing about Hoenheim-Nord terminus on Strasbourg’s tram network is that it’s the second piece of startling design work on the same tramway. 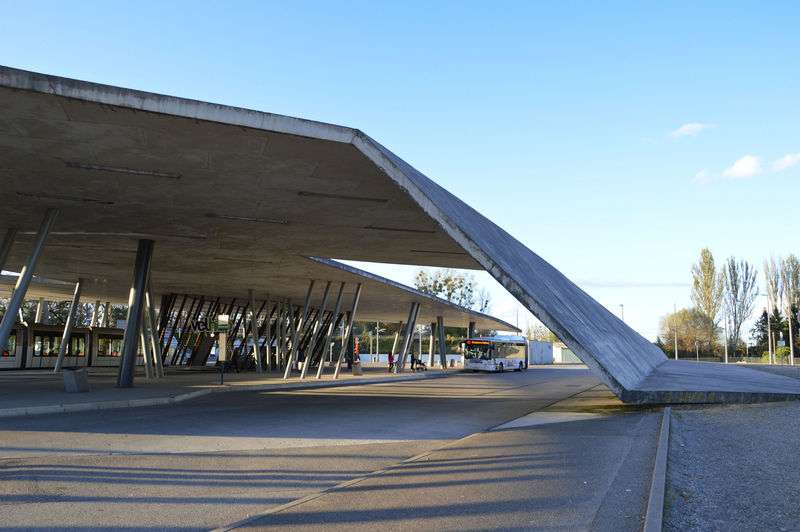 Why Strasbourg’s trams should be blessed with not one, but two stations which feature interesting design work is not especially clear. The reasons are likely to involve the fact that Strasbourg is the seat of the European Parliament, that it’s in France (the home of the majority of the world’s pieces of chic light rail design), and possibly simply the fact that someone on the project team overseeing the light rail network’s construction wanted some good design on the network. Whatever the reason, as the tram system was being developed in the 1990s, several architects were invited to contribute designs, rather than tram stops being left purely in the hands of the engineers. Engineers tend to produce bits of public transport which work okay, but often end up somewhat lacking in the looks department. In the centre of Strasbourg is the tram stop Homme de Fer, by Guy Clapot, which we have looked at in the past. 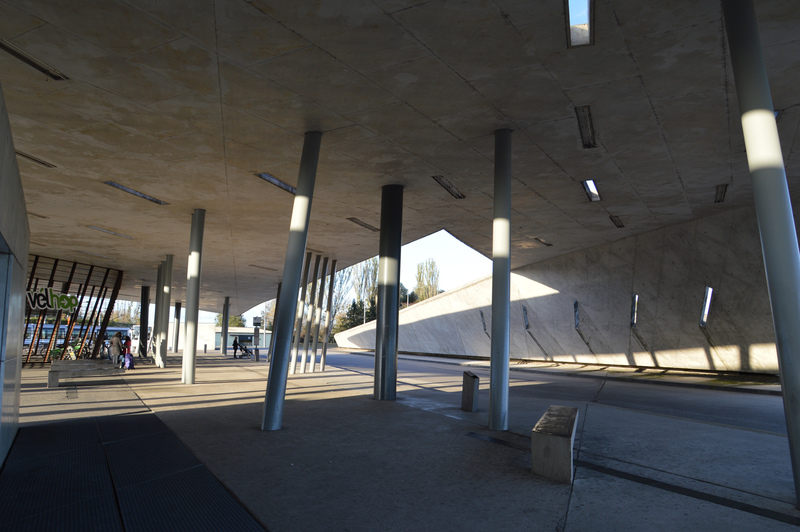 Meanwhile, at the north end of Line B, Zaha Hadid Architects won the commission for the tram stop at Hoenheim-Nord, which opened in 2001. It’s actually a park and ride site, and although the landmark structure on the site is the tram and bus terminus itself, the vast majority of the land area is given over to an 800 space car park (it’s an interesting illustration of the relative efficiency of public transport compared to private car transport). If light rail systems are the part of the public transport offer that aesthetics almost forgot, then park and ride stops are the part of tram/light rail offer that aesthetics not only forgot, but never even thought about in the first place. All too often they are bleak wastelands with pitiful landscaping and row upon row of standard lighting columns casting dim orange light in all directions at night (including, pointlessly, up into the sky). The tram stops are little more than slightly chunkier versions of an aesthetics-free urban bus shelter. These are places to wither the soul. Phoenix Park tram stop (Nottingham, UK) and Wednesbury Parkway (Birmingham, UK), spring to mind but they are hardly the only offenders. Not so at Hoenheim-Nord. This is how you design a park and ride site. Zaha Hadid Architects’ vision for Hoenheim-Nord is based on the idea of patterns of force, flows in the field of electromagnetism. This is highly appropriate given the electric power supply used by urban light rail schemes such as Strasbourg’s. The car park at Hoenheim-Nord. Photo by Patrick Muller [CC BY-NC-ND 2.0] via this flickr page. 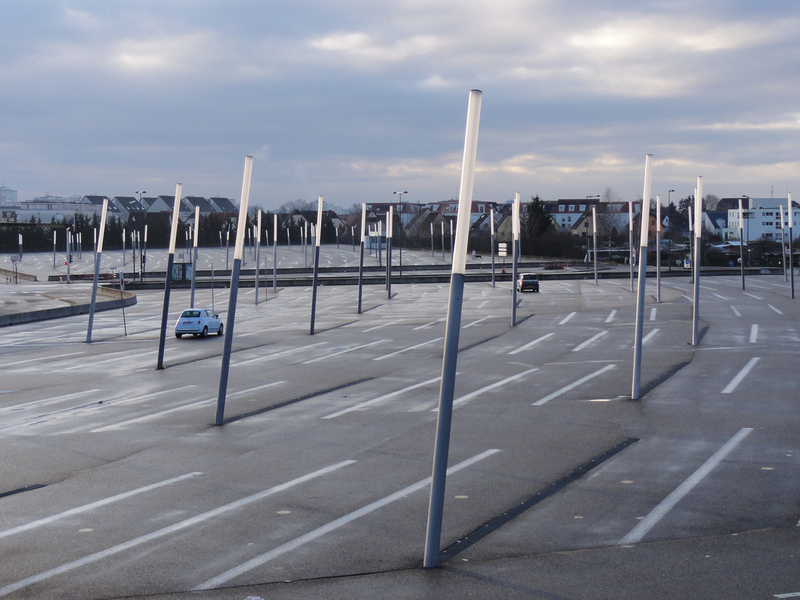 The car park is set out not in conventional straight rows, spaces bordered by white lines on all sides; instead the parking spaces describe a gentle curve around the site, swirling like a magnetic field diagram. The car parking spaces are lined only at the sides. Single dots, electrons in the flow, delineate the separation of one parking space from another on their short sides. Bespoke needle-thin lighting columns thrust upwards from the ground. Regularly spaced, and each one tilting to the same degree, they are oriented along the curve described by the parking spaces. They resemble iron filings standing on their ends in a magnetic field, an effect familiar to all schoolchildren from simple magnetism experiments. The lighting columns and the elements of the main waiting structure on site reflect this third dimension of the electromagnetic field. The supporting columns of the tram stop come in matching angled sets, while the large bike shelter repeats the pattern both on its lattice walls, and on the cycle stands themselves. Angled screens of green glass, virtually the only colour in this monochromatic masterpiece, shelter waiting areas for passengers. The terminus is the main structure on site, serving trams, buses and the bike shelter. 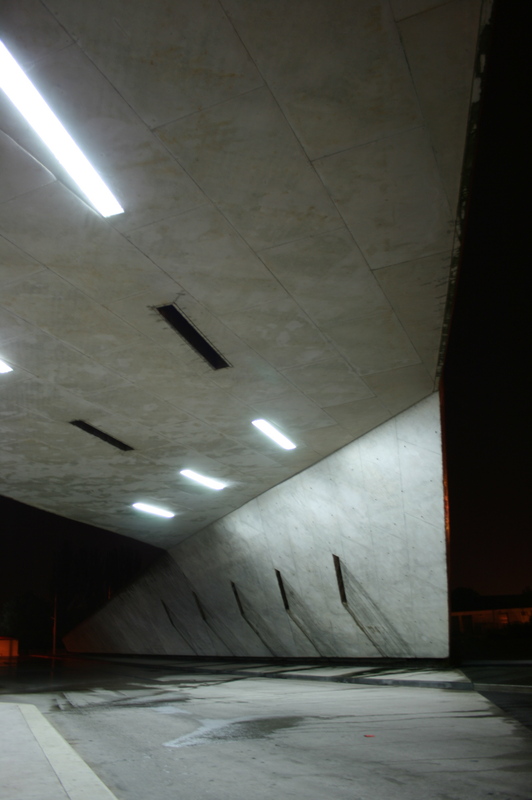 Its roof and walls (the one merging into the other) are constructed from raw concrete, folded like origami. It is a lovely piece of recognisably Hadid architecture (see also the same practice’s much later roof of the Riverside Museum of Transport in Glasgow), in the deconstructivist style. In plan, the structure switches back and forth at sharp angles, cleverly delineating the different parts of the terminus: tram, bus and bike. Its dramatic form is pierced by long, narrow rectangular openings, all again aligned along some invisible forcefield. Some of the openings are skylights, cut through the structure completely, while the rest are housings for electric lighting. During the day, the skylight openings are the brightest, while those housing the lighting are darker. At night, the situation is reversed, and the skylight openings show black sky, while the openings housing the lighting elements blaze with light. This changing positive/negative duality again plays on the ideas of electricity: positive and negative electrodes, and the switching of alternating current. The terminus sits on lighter coloured ground surface treatment, which extends in a curved slice through the car park, most of which uses a more conventional dark coloured material as surface dressing. This delineates the transition from car to tram/bus, and back again. The terminus was the well-deserved winner of the 2003 European Union Mies van der Rohe Prize for Contemporary Architecture (see here) for promoting “the harmonious development of towns and cities”. Not bad for a park and ride site.